Discover Suzhou, one of China’s oldest cities, on a private 10-hour tour from Shanghai. With your own guide, explore the old town famed for its classical gardens, silk, and waterways. See the medieval Panmen Gate and remains of the city walls, admire waterfront Shantang Street, and enjoy lunch overlooking Suzhou’s canals. Plus, visit a silk factory and one of Suzhou’s formal, UNESCO-listed gardens. Entrance fees, private transport, and central hotel pickup and drop-off included. Select a downtown Shanghai pickup time and point, such as your hotel, and make the 2-hour journey to Suzhou by private, air-conditioned vehicle. On route, inform your guide if there’s anything you want to see more of. As your tour is private, the itinerary can be tailored around you. With a 2,500-year-old history, Suzhou was one of China’s major medieval cities, and attracted writers and painters drawn by its beauty. Today, it boasts a charming old quarter famed for its classical gardens, canals, and silk-making. See the 14th-century Panmen Gate and surrounding scenic area near the remaining city moat and walls. View the Song-, Yuan-, Ming-, and Qing-era buildings here before strolling along canalside Shantang Street. Pass boats and bridges, and learn about Suzhou’s centuries-old Wu culture as you watch waterside life. After a Suzhou-style restaurant lunch overlooking the canals, tour a silk factory. Discover the art and history of silk-making, and perhaps purchase some pieces (own expense). 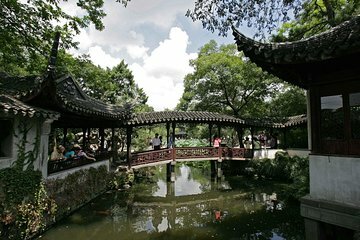 Next, explore arguably the best of Suzhou’s UNESCO-listed gardens. Savor the exquisite landscapes, created in 1342 by a Buddhist monk, as you wander around the sculpted rocks, ponds, and pavilions. Your tour finishes at your downtown hotel or chosen central Shanghai location. For the most part the trip was comfortable. We were 7 individuals who went on the trip and the coaster they provided a mini-bus was spacious and was perfect for the hot and humid weather. During our trip we were with Celine, she was an outstanding guide and showed experience and mastery. However, my only irk was that at times it felt as though she felt a minor annoyance towards us. While it was a very minor detail in our trip, I couldn't help but feel quite awkward afterwards. Jenny was able to reply, sometimes quickly, but other times 5 or more hours after. Still, I found her to be a good host. She was able to accommodate to our queries even though they weren't necessarily about the tour. I came to Shanghai for one week work, with a group of 10 other IT people from around the world. We booked this tour few weeks in advanced. Jenny communicated with me prior to arriving to Shanghai, so that every thing was well coordinated from the beginning. Lee, our instructor on the tour, was very friendly and had very good English. He was very informative and interesting, and the tour pace and locations were great. Will highly recommend Jenny tours to anyone who arrives to Shanghai. A very beautiful experience! Portia was an amazing guide, very well informed and very nice. We could choose exactly what we wanted to see and learned a lot about Chinese culture and way of living. The lunch was typical Chinese food in picturesque environment. The trip in the car was very comfortable. We enjoyed the tour very very much!!! Thank you!!! Very efficient pre-tour contacts via WeChat with Jenny made everything easy and smooth. If you book with them, try and ask for Apple to be your guide: she is professional, knowledgeable, and a lovely person. Jenny was available also for help in Shanghai after the tour. I was promptly contacted by Jenny's Shanghai Tour about my preference for the tour soon after booking. Emails and messages were promptly answered. Due to a slight change in our travel plan, we had to reschedule the tour. This was done without any fuss. Thank you. Our guide, Susie was very knowledgeable. My family of 6 adults including 2 elderly grandmothers, were met promptly at our hotel in the morning and were driven around in a spacious and comfortable coach. This was important as the road trip to Suzhou took nearly 2 hours. Susie was very attentive and made sure we were well taken care of especially our grandmothers. Mineral water was provided to ensure our comfort. I highly recommend this tour.